The following is one of my favorite Qigong exercises. It has multitudes of benefits, especially if you put in multitudes of reps. Get in a slow, silky groove and feel the Qi expand and compress; get smoother and smoother; and get bigger and bigger and better. As you get into high repetitions (50 to 500), the movement will become second nature. It will feel like a pleasant zephyr blowing away your cares as the Qi gently blows and flows through and around you. Ultimately you will feel full with flowing Energy in our body and a calm pleasantness in your spirit. 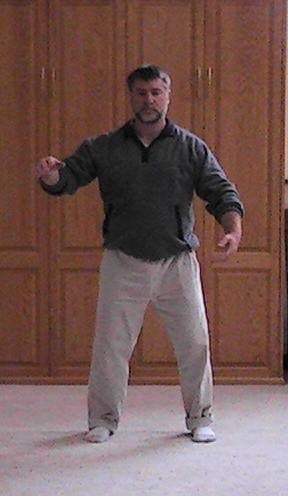 Separating Yin from Yang comes from the Delightful Dozen Set and Primordial Qigong form. Separating the Yin From Yang movement spreads Qi to all parts of your body and balances left and right, up and down, abdomen and chest, in close to the torso and far away to the sides. Create a big ball with your arms in front of your torso, 12 to 18 inches in diameter. Your right arm and hand are curled on top at the chest, palm down. The left arm is close to the lower belly, palm up, also curled. Your hands or arms do not touch the torso. Simultaneously draw the right hand down and to the right side and the left hand up and to the left side. Follow the rising hand with your eyes by twisting your waist to look at it. (Do not twist your knees.) The right hand comes to face palm-down to the right of the right hip. The left hand comes to face palm up to the left of the head. Look at the left hand. The arms are slightly extended (somewhat bent elbows) and along a diagonal line that starts high on the left and descends to the right. Draw the two arms and your torso back to the center to create another whole-arm energy ball, this time with the left hand on top. Separate the Yin and the Yang once more, now with the left hand sliding low to the left and the right hand reaching up and out to your right. Follow the higher, outstretched hand with your head and gaze. Notice how the side-extended arms actually form a wave-like shape. Practice slowly to learn the alternating arm motions. One way to remember the sequence: the arm that is outstretched and higher, will roll in to become the top hand that holds the big ball. Then, the top hand holding the ball, slides out and down like an umpire indicating a runner is “safe.” This low hand curls under to hold the big ball. Then it expands out and higher to the side. The runner is “out”. Structure Principle: Keep knees facing forward. Trains you to turn without damaging your knees. 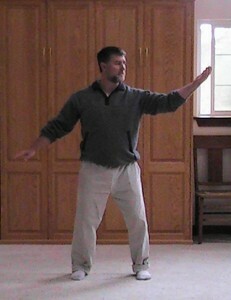 Movement Principle: Balanced opposite arm motions. Move both arms at equal speed in opposite directions. Both arms are equally engaged, though doing different motions. 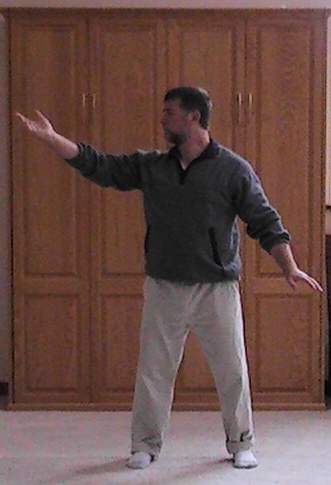 In Qigong, when one arm does something, the other must do something of equal quality and quantity, some expressing counterbalance. Otherwise, one-sided movements lead to physical and neurological imbalances. In Qigong we want to practice being equally balance in all directions, even if various body parts are engaged in different types of motions. This expands your body awareness to more than just what you happen to be looking at. 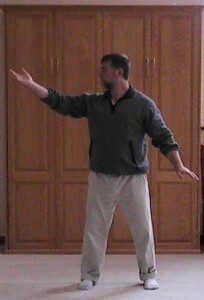 a) Absorb Heaven and Earth Qi into the hands in the hands outstretched position. The lower palm faces downward to absorb Earth Qi. The upper palm faces up to absorb from the vast universe above. 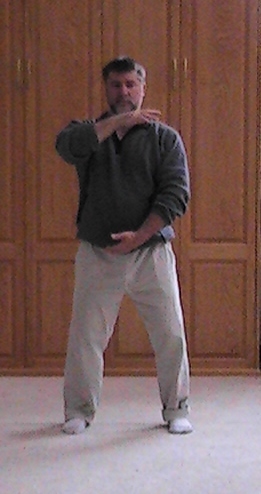 b) Feel the energetic Qi ball between the arms and in the torso, bringing balance and Qi to the internal organs. c) Blend the Heaven and Earth Qi in the big Qi ball. a) Pay attention to the feet as much as the hands. Feel all four equally. b) Go from a medium-sphere in the body to a large one around the body; which energizes your entire personal space. The ball-holding position is done with the whole arm, not just the hands. In the ball position: The shoulders are relaxed; the upper elbow is lower than shoulder; and the wrists are soft and curved. Feel the Qi ball before going into the separation. Be sure when you have “separated the yin and the yang” and the arms are out to the sides that the elbows are still somewhat bent. Open the arms mainly with the back muscles. This means relaxing—as much as you can—the muscles of your shoulders. Relax the shoulders. If you feel them raised up, let them down. Hold the arms out with the muscles of your back. 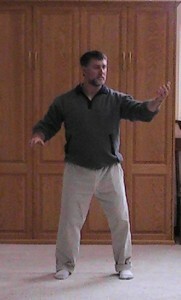 When extending the arms, feel the Qi spread wide to the tips of the fingers and toes. Helps relax tense shoulders and necks. Builds the magnetic fluid aspect of Qi in your hands and entire body, an important indicator of immune system strengthening. Brings your body’s energy field into a state of spherical unity, of wholeness inside and out and all around. Mistake: Twisting knees when you turn.